Mark Twain's witty, satirical tale of childhood rebellion against hypocritical adult authority, the Penguin Classics edition of The Adventures of Huckleberry Finn is edited with a critical introduction by Peter Coveney. Mark Twain's story of a boy's journey down the Mississippi on a raft conveyed the voice and experience of the American frontier as no other work had done before. When Huck escapes from his drunken, abusive 'Pap' and the 'sivilizing' Widow Douglas with runaway slave Jim, he embarks on a series of adventures that draw him to feuding families and the trickery of the unscrupulous 'Duke' and 'Dauphin'. Beneath the exploits, however, are more serious undercurrents - of slavery, adult control and, above all, of Huck's struggle between his instinctive goodness and the corrupt values of society which threaten his deep and enduring friendship with Jim. Born Samuel Langhorne Clemens in 1835, Mark Twain spent his youth in Hannibal, Missouri, which forms the setting for his two greatest works, The Adventures of Tom Sawyer and The Adventures of Huckleberry Finn. Trying his hand at printing, typesetting and then gold-mining, the former steam-boat pilot eventually found his calling in journalism and travel writing. Dubbed 'the father of American literature' by William Faulkner, Twain died in 1910 after a colourful life of travelling, bankruptcy and great literary success. 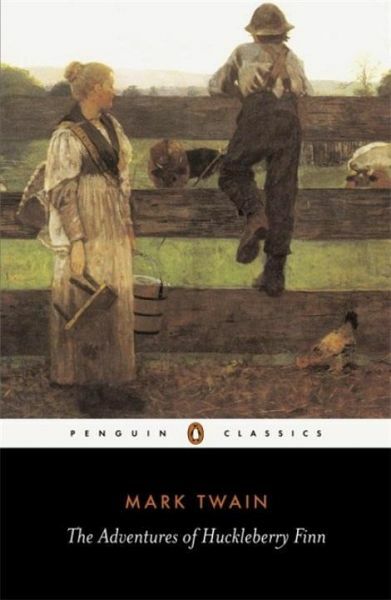 Mark Twain: Huckleberry Finn. Insel Verlag, Frankfurt am Main und Leipzig 2009. 503 S. mit Anmer- kungen. 11,90 Euro.